Home Gas Generator What are the Best Home Generators for Power Outages 2014? What are the Best Home Generators for Power Outages 2014? When the power goes out nobody wants to be left in the dark. That is why there are affordable alternatives to the large expensive, backup generators for you to use in your home, but not every generator is one of the best home generator for power outages. Make sure not to rush out and buy the first generator you find. Take your time, because this could be an investment that will save you time and energy. Before you select a generator there are a few factors you should consider first. You must decide what you need to use this generator for, whether it is for a few appliances of the entire home. What type of fuel would you prefer to use, and how long you need the generator to run for you. Once you figure these factors out, the rest will be easy. To run most necessary household appliances (fridge freezer, laptop, TV) and sump or well pumps, and a furnace fan takes a generator that will create about 5000 to 7000 running watts. I have selected the best rated, most reliable and trusted portable backup generator models on the market. 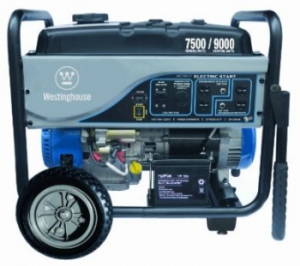 The Westinghouse WH8500E Portable Generator is an approx 7,500 Watt Gas Powered genny that received an almost perfect 5 out of 5 rating bycustomers on Amazon. Mainly because it is rare for a portable generator to have a 1 touch electric start, plus a 420cc XP Series engine.The electrical output is increased due to the high efficiency alternator with high efficiency laminations. It is protected and safe to run out in the weather, so no need to bring gas engine fumes into your home. This also reduces the fuel consumption at the same time. This generator is capable of handling many different tasks, whether it be supplying power during a power outage, or powering an entire home. A generator may seem very complicated to use, but to the contrary, this generator has an intuitive interface that allows for very easy operation. It is also very quiet due to the Pulse-Flo muffler so will not bother your neighbors while at home or if you take it RVing or camping. Users also like the long run time, up to 13 hours at a 50 percent load with a full 6.6-gallon fuel tank. This means you can go all day or night and still have hours left before it would run dry. This model really has been a winner since it came out on the market, Fall 2012, due to the ease of use, reliability and reasonable price of under $1000. Another one of the best home generators for power outages is the Powermate PM0497000.04 as it has one of the best brands small of engine you can buy, and it still quite reasonably priced and just over $1100, though it does go much higher, so it’s better to buy that wait til there is a storm forecast. 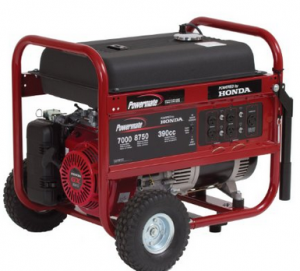 This is an easy to start 389cc 13HP Honda gas motor powered 8,750 Watt Generator that is handy and portable.This generator comes equipped with an 8 gallon gas tank with a fuel gauge and it runs for up to 12.3 hours at a 50% load, which is popular with users. 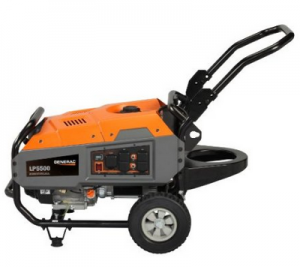 With a reliable 13 HP Honda GQ390 OHV gas engine there is no guessing why this is one of the best generators out there. Especially because it will shut down when it is low on oil, and has a 2 year warranty that you will likely never need. To top it off, the control panel contains 4 120 volt outlets, 1 120/240V twistlock outlet, and a circuit breaker protection. This is a rare portable generator, because it is strong enough to power up the job site, yet it is still great to power up the home during a power outage. 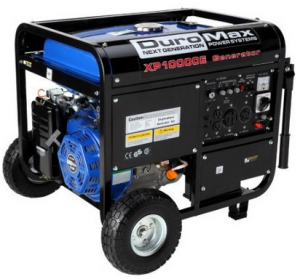 Very effective and affordable at under $1000, (lots of bang for the buck) and very portable with the wheel kit and is yet still one of the best home generators for power outages is the DuroMax XP10000E.This powerful 10,000 Watt Gas Power Generator had a 389cc 13HP engine for converting gas into electricity for you. The electric start is an awesome feature for frustration free ignition, when it is storming and you need to get this up and running. What makes it one of the best is the 16.0 horsepower air-cooled OHV engine which outputs 8,000 running watts and peaks at 10,000 watts, which is used to start your appliances. You can choose whether you would like to start it easily with the electric start or you can use the standard recoil start if the starter battery is not charged. The power panel features 2 120-volt, 20-amp household outlets, which will supply all of your outlets. It doesn’t stop there, it also has a 12-volt DC output with that can charge your batteries and is also a quiet running unit. Run time is a decent 10 hours at 50% load when the 8.3 gallon gasoline tank is topped up, so you don’t have to worry about it running dry in the middle of the night or if you have to be away from home.